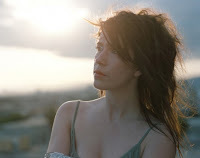 Imogen Heap ended her tour on Thursday night in Williamsburg. As I was walking toward the concert hall, I noticed a large number of trucks outside. What I found out, by reading the audience disclaimer on the door, was that the show was being filmed by Billboard.com. Once inside the hall, I took note of stage which looked liked a cross between an electronic musicians garage and a performance artists studio. There were lots of musical toys. Aside from the cello, there were gongs, tubes, chimes, bells and a whole bunch of instruments that I don't have a name for or which I am unfamiliar. On center stage there was a gutted white baby grand piano. The bend of the baby grand (where the strings would be) was done in plexiglass making it possible to see long white tubes lying down inside of it. Behind the baby grand was a large white paper mache kind of tree which threw shadows on the matching curtain behind it. In front of the baby grand was a chair with a white shag carpet over it for the cello player to later sit on. The show was hosted by Imogen Heap, who's opening acts were solo artists themselves and also members of Imogen's ensemble later in the show. The following is the rundown or workup to Imogen Heap's set. First up was Back Ted n-Ted whose real name is Ryan Breen. I'm sure his name has a connotation that I'm unfamiliar with or maybe I'm just not young enough. (Yo! AARP awaits all of us. The only other alternative is death.) In tight skinny jeans, makeup, a button up shirt with a silver vest, bow tie and sneakers, Ted is artist of contradictions. Back's MySpace page denotes his music as New Wave for the 21st Century. To my ears, Back's approach to electronic music sounds similar to 80's bands like Naked Eyes and Our Daughter's Wedding but with contemporary nuances. I would also say that Back's songwriting is very pop with a bit of Americana which I heard in his melodies. The timbre of his voice during the song “Mirror” reminded me of Jackson Brown. It may have been that I was picking up on the fact that he filtered his voice or that he is originally from Phoenix. I suspect it's a little of both. Ted did 5 songs. My favorite song was "Hookie" which was very different from the other 4 because the music sounded very much like New Order. Ted started the song off by programing a kick and snare pattern and then adding elements of top. He ended his set by putting down his guitar, singing while dancing across the stage and going through the audience giving high fives. The title of the last song was "War Song" (No! - not the same one as Culture Club ). The hook was "The War is over" which he harmonized with himself and then had the audience sing along. Everyone in the audience, including myself, loved it. The second artist of the evening, Tim Exile also did 5 songs. Two of which he referred to as being on his current CD and the others were created that evening. It's hard to explain what Tim Exile does but I'm going to try. Tim is DJ but also a musician as well. In real time and often at the same time, Tim mixes sound loops using several effects like reverb, delay, chorus, harmony and many other kinds of treatments. From what I have read about Tim, he has developed software and is a bit of a technician. For example, one of the ways he has rigged up his controls is to use a computer game control stick. Tim started his set with Imogen singing the line "Harold the Lion." before she exited through the stage door. Exile was then off to the races looping and creating a soundscape out of thin air. The "Harold the Lion" loop went from the ethereal through jungle rhythms to hip-hop beats working up to a frazzled ending at which point Exile exclaimed with his British accent "Oh my God - It turns to chaos really quickly." For another song, Tim Exile gave the audience the microphone. As each audience member passed the mic around, Exile worked his magic from the stage. He looped, he filtered and he played with the rhythms to create a spectacular collage of sound and music. He set was amazing and interactive. It made me sorry I was in the balcony because I wanted in on the action down on the floor. As Hostess, Imogen Heap introduced Zoe Keating an amazing, underline amazing, avant-garde cellist. After hearing her music on MYSPACE, Imogen dropped Zoe a line. Imogen said Zoe responded to the email by asking if it was who she thought it was. Heap responded saying yes it was and asked her to come on tour. Imogen Heap, holding a wine glass, spoke to the audience a bit before commencing with here portion of the show. She told us, despite the taping, she planned on doing the same set she had done through out her tour. She said she was under the impression that someone on behalf of Billboard.com was supposed to introduce her but then was told that was not the case, before walking out on stage. She started the opening song "First Train Home," which is also the first song on her new CD "Eclipse," by creating a sound as her fingers circled the rim of the wine glass. From that point, Imogen moved gracefully through 17 songs in total. Some of the songs were performed solo and some were performed with give or take one of her four touring buddies. Imogen plays a numerous amount of instruments on stage which forces her to move around a lot. So it was automatically noticeable that she was wearing body mics, not only for her vocals but for the acoustic instruments as well. In fact, before playing the African instrument called Mbira, she showed the audience the tiny microphones attached to each of her wrists. One of the many things I give Imogen props for is that her and her co-performers pull off what could easily be a technical nightmare. The stage is filled with instruments and equipment. I'm sure their were technical glitches, here and there during the show, but none that I could really pic up on. I guess that's the mark of a true pro. What I loved most about Imogen Heap was her bubbly playfulness. I found her to be a delightfully funny and talkative woman who loves to show off all her musical toys. There were points in the show where Imogen was charmingly silly. One point was when she put on a hand puppet who turned out to be none other than “Harold the Lion.” Later on, before playing “Little Bird” she showed us a rubber bird that her mother gave her for Christmas. She said the rubber bird made the same sound as the birds in her garden. On Thursday night it occurred to me that Imogen Heap is heavily interested in the colors of different sounds and the rhythms she can create with those sounds. That interest does not only apply to her instruments but to her vocals as well. Her vocals are just as focused on creating lyrical melodies as they are creating rhythmic and chordal patterns. Although what I just stated may be a given, it became more apparent when I was watching her in concert. The full range of Imogen's voice on the song “Aha,” was even more electrifying live than it is on CD. Imogen Heaps low alto voice and what she does with it is incredible, with and without effects. “Aha” was set up with a funny story explaining Imogen's inspiration for the song. She said that she had dinner with someone who claimed to be a strict vegan. But the “Aha” moment came when she decided to have a digestive for dessert and he said he could have just one. I got a kick out of watching Imogen deliver one of my favorites which is “Bad Body Double.” It was one of the few songs she sang hands free, rhythmically emoting back and forth across the front of the stage, while Tim and her drummer/guitarist (who's name I believe is Richie) played behind her. On the musical break of the song Back Ted n-Ted comically playing a keytar in black wig and shades. Including the bonus track “Speeding Cars,” Imogen did all the songs from Eclipse except for “Earth.” She said “Earth” required too many voices for her to duplicate by herself but she planned on having a chorus of background singers to do it the next time around. She stated that she plans to do an online tally of the audience's favorite songs so she can perform them for her next tour which will be in April. For the encore Imogen returned with Keytar in hand to do “Hide and Seek. ” Although I expected it, I didn't care if she did the song or not because I really enjoyed all her new material just as much or even more. Since her encore basically consisted of songs from her CD Speak For Yourself, I would have loved to have heard “Clear the Area” or “Say Goodnight and Go.” But alas there is no clairvoyant performer who can play all my favorite songs. The encore did include some audience participation. She split the audience into 3 sections and gave us all a crack at singing the hook “Just for Now.” The musically rich evening ended with the song “The Moment I Said It.” Imogen Heap said that it was the last song she did for each show on her last tour and that it felt equally as right for this tour as well. She was on the money – it was a perfect ending to a great show.